Why does the Erling brick (#4070) have a ridge below its outward facing stud? Whereas the more versatile and less common #87087 does not? 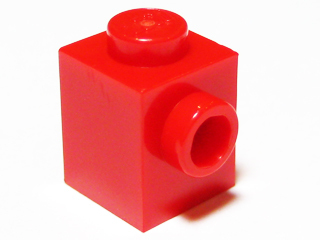 The #87087 piece also has a better use in SNOT usage, as it can accomadate larger bricks. The ridge is there to make the base the standard 5LUs wide (see also "What is an Erling Brick"), enabling it to accept the standard stud. I believe the rest of the brick was thinned out so that the combined "depth" of the Erling brick and a 1x1 plate (its common usage as a headlight) was the same height as a standard brick. If headlight bricks are turned over by 90° and a plate is attached to the stud then this construction is as high as a standard LEGO brick or a layer of three standard LEGO plates. It also helps to keep the 1x1 plate straight to the bricks edge. Not the answer you're looking for? Browse other questions tagged piece-information snot or ask your own question. What can I do with all my brick separators?